If you have not heard... she's here!! Quick summary of yesterday’s events… Holly had bleeding when she got up at about 6am. The bleeding did not seem to be stopping. Holly texted me at home and we tried make a decision on if I should come up or not. I went ahead and got things together and about 7:45am they told me to come up. I hopped in the truck and drove in rush hour traffic (as quickly as I could) and got there at 8:35am. I came to the room where Holly was taken from and the nurses were there waiting for me to get me dressed in scrubs to join Holly in the OR. I made it to the OR at about 8:45am and was asked to take a seat and wait for them to call me in. There was another gentleman there whose wife was having a scheduled C-Section and we talked for a bit and he took that picture of me. He got called back and I continued to wait. As I was sitting there I heard about ten short very loud cries and I was confused. I knew it could not be the guy that just left, so was it mine? 9am came around and a nurse came to tell me that the baby was out because they had to move quicker than planned. I learned later that they were almost ready for me to come in but when they were looking for Abi’s heartbeat they could not find it. They decided right then to get the baby out as soon as possible. They cut Holly open and got her out immediately. Turns out she was just hiding from the monitor and was fine all the time. They let me look thru the OR window and I saw Abi being tended to at the left of the room, and then I looked right and saw Holly on the table with a drape right below her neck, she was smiling and talking to the Anesthesiologist. Then I looked at her lower body and I saw a large red bloody ball on her belly. I asked later and I was right in assuming it was her uterus. Abi was delivered with no problem other than she was delivered prematurely at 34.5 weeks. She came out of the OR and I joined her as she was moved to the NICU. Back in the OR, the doctors had a hard time detaching the placenta from the uterus. It was growing into the uterus and when it was removed there was excessive bleeding inside the uterus. So much so, that Holly received a transfusion of two units of red blood cells. A balloon was placed inside the uterus and filled with saline fluid. That along with the uterus contracting, as it usually does after delivery, helped to stop the bleeding. Back in the NICU, I was present while the nurses helped Abi clear her lungs of amniotic fluid. I watched them weigh her and measure her length. They inked her feet and took footprints for the birth certificate. Then they hooked her up to all the machines to monitor her breathing, pulse, blood pressure, oxygen level, and they put a cannula in her tiny nostrils to deliver oxygen. They also placed a tiny IV in her hand. Seeing her brought me so much joy and happiness. Her little hands are so soft and they grasp my finger whenever I put my finger in her hand. I have never felt so proud in my life and have never teared up just by looking at something. She is so beautiful. There are no words. I can’t wait until I can hold her in my own arms. Holly’s parents and my parents came to the hospital to see Abigail and to see Holly for a short while. It was short for them but long for me. They are allowed into the NICU with only the parents and one at a time. Each time you enter the NICU you must scrub-in up to your elbows for three minutes and cannot wear any jewelry on your wrists or fingers. Doing this four times plus my own visits to see her was a bit tiring yesterday, but I am glad they got to see their grandbaby. My sister was also kind enough to bring me dinner for last night and lunch for today. My mom is making me dinner for tonight and tomorrow. Food from family and friends has been completely awesome… thank you. A few times yesterday and once overnight Abi’s breathing became very shallow and almost stopped but they usually turn up the oxygen from 21% (which is our regular atmosphere) to about 27% and she starts breathing again okay on her own. This very normal with preemies. Overnight she also knocked the IV loose from her hand and they had to place it into her scalp instead. It is definitely more secure there and should be better for her. Holly went to recovery after the surgery and was moved several hours later to a room in Labor and Delivery for very close observation. The nurses and doctors kept incredibly close tabs on her because of the balloon and blood loss and were in her room every hour for vitals but really almost constantly. What was impressive to me was that the doctor that performed the C-Section was there with her checking in almost all night also. You don’t see many doctors who tend to their patients like that. I was very impressed. It was so busy in the room that the doctor and I had a discussion and she urged me to head home as I would not be able to get any sleep in her room. I agreed and drove home to get some rest around 1am. I got up early and headed back to the hospital this morning after rush hour died down, and when I got there they were transfusing the second of two more units of blood. Holly looked good, but her labs dictated that her blood counts were low and she needed more blood. After that finished, things moved pretty quickly. They had already started to release some of the saline from the balloon and her vitals were improving. By 2pm the balloon was completely removed and there has been no additional bleeding. Holly has been able to use the breast pump to start pumping colostrum for Abigail and this afternoon I had the pleasure to witness her first bottle feeding of about 5CCs! She ate like a champ and was ‘milk drunk’ afterward. It was so cute! And she's even opening her eyes. Just a while ago Holly finally got a meal of clear liquids and I think that settled her enough to get some rest. As I type this Holly is finally taking a nap and getting some sleep. She only has an IV and Foley catheter. Both of those will be removed shortly and we will be moving to a post-partum room. She has been a real trooper and the nurse that just went off shift told her that all the nurses have been saying how much they like Holly and what a good patient she is. In fact, some of the nurses know that Holly is here going through this and they specifically asked to be her nurse for the shift. I also don’t remember how many times I have been stopped in the halls here by staff asking how ‘she’ is. But now I have to clarify with them… do you mean ‘she’ as in Holly or Abigail? What a new experience. All in all, I simply cannot tell you how impressed I am with OB-GYN North and St. David’s North Austin Medical Center and Women’s Center of Texas. They are a true blessing. As of now we are requesting to have no visitors here at the hospital. Holly and I are very tired and we need time to adjust and rest so that we can focus our attention on our sweet daughter Abigail who is in the NICU. In addition, please do not send any gifts, cards or flowers to the hospital as they become a burden for us to keep track of. If you just have to do something, we ask that you please consider purchasing something from our baby registries. Specifically, we are in need of cloth diapers from our registry at diapers.com. We have also registered for necessities at babiesrus.com. Thank you. Holly may be discharged as soon as Monday. But we really have no idea how long Abigail will have to remain in the NICU. It depends on her independent progress. Again, thank you to everyone for your prayers and thoughts. We could have not have done it without you. But we ask you to keep it up! We still have a way to go. So I am sure everyone knows or has heard women have crazy dreams while they are pregnant. I had some pretty wild and vivid dreams before pregnancy but these during pregnancy have just been weird. I have had a dream about my little brother as a child being thrown into a lake by our pastor’s son and when I went to jump in to save him I stopped myself and called for help instead. I had a dream about us having a social gathering at our home and Roger smoking something illegal which I was not happy about and gave him a lecture in the dream. I had a dream about the maternal fetal medicine doctor calling us to tell us they made a mistake and we are actually having a boy. Don’t worry we have checked at every ultrasound that we are still having a girl. I even had a dream about being on a cruise with Shaquille O’Neal for a reality television show and his first ex-wife (I don’t even know if he has an ex-wife or how many ex-wives he has, but this was a dream.) and I hit it off really well and spent a whole production day talking and enjoying each other’s company. I even shared my testimony with her. Yes, that’s a strange one. I don't even watch basketball. The latest really weird dream was a couple mornings ago and it involved my mom. If you know my mom you know she is country and crazy and I mean that in the nicest way. All of my family is shaking their heads in agreement right now. She does stuff all the time that makes us roll our eyes, shake our heads and laugh our butts off. 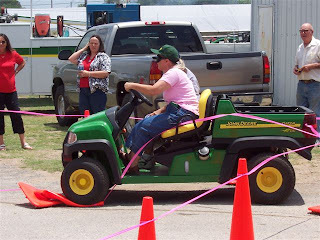 See the picture below of my mom in a blind fold John Deere tractor driving contest. She's fun and crazy. When I told Roger this dream after I woke up that morning he almost spit his yogurt out laughing so hard. She is hilarious. Now on to the actual dream. So my mom was driving my vehicle on Highway 21 from Smetana, the community where I grew up, and Bryan. Smetana is about 10 to 15 minutes outside of Bryan, Texas. She was driving a little crazy. Nothing really new here. Sorry mom. (I know she will read this.) And I said something to her about her driving. I don’t know if I was pregnant in this dream or not. So we’re driving down Highway 21 and it’s really curvy in my dream. It’s not super curvy in real life. And I keep seeing grass as we are driving along almost like I’m flying right above the top of grass. I don’t know if my mom is swerving on and off the road or what but I see grass over and over again. At one point I told my mom I felt like she should go the speed limit. So she sped up really fast. Obviously she was going under even though she was driving crazy. Still seeing grass in between these other events. We came around a very sharp turn and almost hit a semi as it was crossing over the highway which is divided in the between the East and West lanes. And of course I said something to her about her driving so crazy and we were almost in an accident. As we are driving along, I look out the window to the right where there was a steep driveway to a closed business and there were football players in full uniform running drills up and down the driveway. This is weird because there is no school anywhere near here. We continue to drive along and I look to the left across the divided highway and there are open fields full of crops like wheat or something. And I say to my mom, “When did they start growing grain here? It was always just cattle here before.” All of a sudden we are in the field but instead of there being wheat growing it is grass. I turn around a few times and it is just grass all around me. I say to my mom something about the grass. Then I ask her, “What is that?” I look behind me and there is a wild fire heading straight to us. I turn back forward and I see my parents’ house in front of us which is really far from where we were driving. My dad is sitting on a lawn chair under a big oak tree in their yard and my brother is walking past the side of the house. My mom is now near my dad. So I run to the fence that separates my parents’ yard from their front pasture as I’m yelling at them to get the water hose. I jump up on the fence yelling over and over again as I see them running into action. Someone hands me the water hose and I start yelling to turn it on. That’s when I woke up.